Natural Transitioning™ (NT) was founded by Tristan Skye in 2008. It is the process of transitioning from female to male (FTM) by raising the testosterone levels your body already naturally produces without injecting synthetic testosterone. 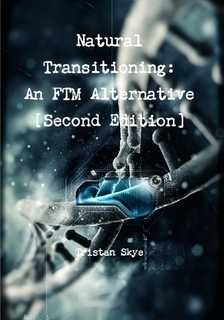 In this book, you will uncover years of dedicated research and my personal experience as a transgender man developing this alternative method of transitioning. This second edition is quite different from the first and takes a truly natural, holistic approach, with guidance from naturopathic doctors (from both the United States and Canada), Chinese medical practitioners and herbalists. Not only is this a guide book that will help you transition without synthetic hormones, it is also a guide book to help you achieve a greater health for your overall being. Natural Transitioning™ (NT) was founded by Tristan Skye in 2008. It is the process of transitioning from female to male (FTM) by raising the testosterone levels your body naturally produces without injecting synthetic testosterone. In this book, you will uncover years of dedicated research that is documented in multiple medical journals, and my personal experience as a transgender man developing this alternative method of transitioning. This second edition is much different from the first, almost opposite, and takes a truly natural, holistic approach, with guidance from naturopathic doctors (from both the United States and Canada), Chinese medical practitioners and herbalists. Not only is this a guide book that will help you transition without synthetic hormones, it is also a guide book to help you achieve a greater health for your overall being, including supplements, diet and fitness. Fundraising efforts by local groups, the Atlanta Radical Faeries and the Atlanta Sisters of Perpetual Indulgence, will be honored on May 19th at the First Existentialist Congregation in Candler Park from 5pm – 7pm. ATLANTA – The Trans Health Initiative (THI) is pleased to announce the availability of Hormone Replacement Therapy to the transmasculine community. THI’s new coordinator, Sybastian Welch (a trans-identified man and advocate), and new Medical Director are committed to providing consistent and high quality health care. They reexamined protocols and integrated recommendations into the program to help realize the actual needs of the Trans-masculine community. THI has offered sensitive and affordable health care to gender variant and intersex individuals since 2000. THI is a program of the Feminist Health Center’s Cliff Valley Clinic located at 1924 Cliff Valley Way NE in Atlanta. The THI program seeks to reduce barriers to health care services and hormone replacement therapy for transmasculine individuals. We offer sliding scale fees and relaxants or anesthesia for lower exams, colposcopies, biopsies and other medically necessary procedures that some clients feel may be emotionally and/or physically intolerable if they were awake. THI follows the Harry Benjamin International Gender Dysphoria Association’s Standards of Care guidelines and is also informed by Medical Therapy and Health Maintenance for Transgender Men, the American Congress of Obstetricians and Gynecologists (ACOG), and the World Professional Association for Transgender Health (WPATH). For more information about THI, please visit www.transhealthinitiative.org. Fundraising by local queers groups helped provide necessary funding for services. The Intergalactic Love Affair (IGLA) is a community celebration-meets-fundraising event lovingly thrown together by the collaborative efforts of the Atlanta Sisters of Perpetual Indulgence and the Atlanta Radical Faeries. The event was conceived as an opportunity to unite the passion and creative powers of a group of friends toward raising funds for queer-minded organizations in the Atlanta community. In its inaugural year, all proceeds from IGLA went to YouthPride to shine a light on the issues facing young queers in our community. This year, the event highlighted an often overlooked group in our alphabet soup – the Atlanta transgender community – by donating 100% of funds raised from this year’s event to the Feminist Women’s Health Center (FWHC) and their Trans Health Initiative (THI). The Atlanta Sisters of Perpetual Indulgence, order of the Flaming Sugarbakers are 21st century queer nuns dedicated to the manifestation of cosmic joy through freedom of expression, community outreach, social activism and charitable acts. Their manifest states, “We love expiating stigmatic guilt and spreading cosmic joy. We paint our faces to express the diversity in the community and by bringing our inside expressions out and to reflect the beauty of the people we meet and serve.” The Sisters have been in Atlanta since 2009 and delight in helping our communities through condom ministries, diverse fundraisers and promoting health awareness. They are first-line fighters in the campaign for universal human rights in the queer community. For more information, visit http://atlsisters.org. The Atlanta Radical Faeries are a very loosely aligned fellowship of friends, family, mutants, and misfits uniting countless queer sub-cultures to foment community through acts of radical self-expression, love, and compassion. TQ Nation is the #1 Social Networking Site for the Transgender (FTM, MTF, Intersexed) & (Gender) Queer Community! CLICK HERE to Join the Revolution! Enter your email address to SUBSCRIBE to this *amazing* blog and receive notifications of new posts by email. You know you want to! So, DO IT! The TQ Revolution · TQ Nation: For US, By US!